Our experienced team has worked everywhere from the NHS to chemical manufacturing sites offering a wide scope of temperature calibration for thermometers, thermal imaging cameras, anemometers and hygrometers. 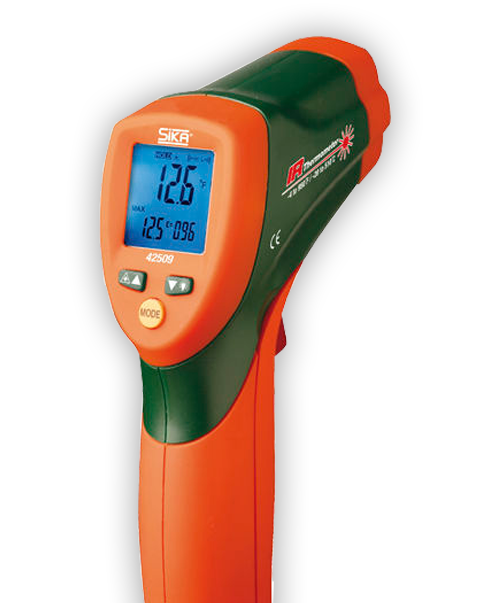 Experienced in calibrating many brands of temperature devices from COMARK, Fluke, FLIR, Testo , Sika and more. Choose from Standard Calibration or a UKAS Accredited Certificate. We are a UKAS accredited laboratory for the activities listed on the UKAS Schedule of Accreditation. Our team of highly trained professionals are able to ensure that your temperature measuring devices are performing correctly and conform to all manufacturer standards. We provide fully traceable certificates for both our Standard and UKAS services. We are able to carry out UKAS accredited calibrations on many makes and models of thermometers, thermocouples and temperature devices. Our Laboratory is accredited to ISO/IEC 17025:2005. The PASS UKAS Accreditation number is 8239 and you can view our UKAS schedule at the UKAS website here. Please see the UKAS price list above and note that any UKAS Calibrations are not covered by our 3 day or free offer*. PASS is able to carry out temperature calibration and thermometer calibration on-site in places such as industrial and chemical plants, hospitals, pharmaceuticals and healthcare properties including NHS and private hospitals across the UK.